Founded in 1958, CHAENG (Xinxiang Great Wall Machinery Co., Ltd.) sticks to go its own way from independently researching and developing the first ball mill to independently matching 1.5billion tons slag powder production line. At present, it has become a famous supplier specializing in manufacturing large kilns and ball mills in China, and once won many honors such as Top 100 Suppliers of Cement Industry in China, Top 10 Innovative Enterprises in Cement Industry in China, High Growth Private Enterprise in Henan Province and so on. After near 60-year development, CHAENG now has modern plants, superior equipment, advanced processes and all conditions to manufacture high-quality products. It has over 500 sets of various machining equipment, and the main equipment includes Φ8m Russian double column heavy vertical lathe; Φ8m gear hobbing machine produced by Russia, T6920 boring and milling machine produced by Czech, WIISTNC120×3000 type upper roller numerically controlled universal lapping machine, Φ6.3m×20m cylinder lathe, the largest and the most advanced cylinder-overall electric-heating automatic-controlled annealing furnace in domestic machinery industry, five 150t automatic submerged arc welding production lines and so on. The specifications of the equipment are complete with advanced technology, and the company has formed powerful whole-set processing capacity. In 2007, CHAENG established its large casting base whose main plants cover an area of 25 thousand m2. The base can manufacture 50 thousand-ton castings and the weight of single casting it produced can reach 120 t. The base is the largest one in Northern Henan with advanced technology and equipment, and CHAENG also become the third enterprise which has the production capacity to manufacture large casting in the industry in China, which has positive effects to guarantee the quality of the productions and the date of delivery. As the person in charge of CHAENG, Wang Jizhong always believes that there is weak thought and no weak market, and to stand firm in the complex market, all staff in CHAENG must break a new path. In the face of the problems of saturated capacity in the industry and aggravating environmental pollution, to develop energy-saving and cost-reducing new equipment has become the impending problem. 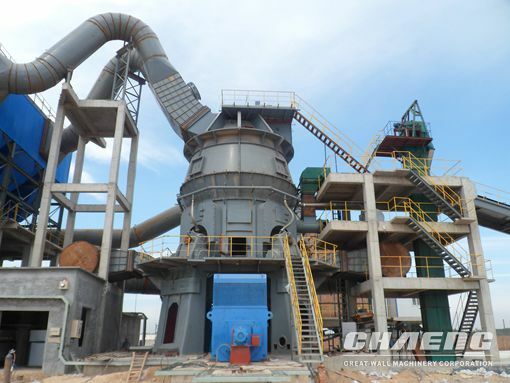 In 2011, CHAENG launched the slag vertical mill, and the slag powder ground by the slag vertical mill can equally replace the cement content used in all kinds of concrete and cement products and can obviously improve the overall performance of the concrete and cement products. To further quicken the promotion power and speed of new energy-saving vertical mill, in 2010, CHAENG invested 50 billion yuan to build the first vertical mill demonstration and training base ----the slag powder demonstration and training base with annual production of 600,000t in China adopting GRMS46.41 slag vertical mill made by itself, which can offer clients visual and clear on-line operation and training. By now, CHAENG successively signed EPC contracts on industrial residue grinding projects with more than 100 cement plants and steel plants at home and abroad, such as Shanghai Baosteel EPC slag powder line with annual production of 1,500,000t; Henan Xinxing slag powder grinding plant with annual production of 1,500,000t; the EPC slag powder production line with annual production of 1,000,000t for Henan Meng Electric Group; Aosen Steel EPC slag powder production line with annual production of 600,000t; Henan Yuhui slag powder EPC production line with annual production of 600,000t; Guangdong EPC slag powder grinding mill with annual production of 600,000t; Liaoning Dandong EPC slag powder production line with annual production of 450,000t; PT. Indoferro EPC nickel slag powder production line with annual production of 300,000t; Xuzhou Southeast Steel EPC steel slag powder production line with annual production of 300,000t and so on. To make global clients use the equipment manufactured by CHAENG is our pursuit, and to make the equipment made by CHAENG help global clients to get more wealth is our mission.